You might find the cost of the item you want varies significantly from store to store. Never buy anything without first doing a little research. Google will show you multiple prices from different stores, and an app like ShopSavvy makes it easy on the go. Many credit cards offer cash-back incentives. You'll find that 1-2 percent cash back is standard, although sometimes it's higher on items like gas and airfare. As long as you pay off the balance in full each month, you're instantly cashing in every time you swipe. Pick out everything you want, put it in your cart, and then skip the final process. Many sites will encourage you to come back and check out with a discount. Just check your email (you may even get an offer code as you attempt to leave the site). After all, offering you 10 percent off is better for them than you not spending any money at all. Warehouse clubs. Outlet and factory stores. These are places where the emphasis is on getting the most value for your money — not paying the full retail price. You'll be getting the same items, only in bulk or off season. It's great if you don't care about wearing the very latest fashions. Haggling has become a lost art in America, but it can still work wonders for your budget. Polish your silver tongue and start asking how low merchants can go on the price of something you want. Or, ask them to throw in something else for free, which you could always sell later to save even more. Don't listen to anyone that says cash is dead. You may not carry as much of it in your wallet as you used to, put the prospect of a huge wad of cash in hand is very appealing to car dealerships, homebuilders, and anyone selling high-end retail. They'll offer a cash discount in most cases. Have you ever been grocery shopping at night? You'll find all sorts of markdowns that were full price just a few hours earlier. You could also try going early in the morning, when items that didn't sell get one final markdown before leaving the shop floor. Score major discounts for buying dented, scratched, bruised, and otherwise imperfect items. Does it matter that the fridge has a small ding in the corner? It certainly doesn't stop it from being a working fridge, and it's 25 percent off. Same goes for fruit, electronics, and almost anything else. Sometimes, kindness is all it takes. Mark Ellwood, author of Bargain Fever, says that "Just being a friendly, nice shopper gets you free stuff," adding that most sales staff can knock 10 percent off the price instantly if you are polite, helpful, and ask nicely about flexibility on price. Shopping is just a waiting game that you have to play sometimes. Clothing will go on sale as the season starts to close out. Electronics go on sale when new models come in. Books and blu-rays get discounted once they're no longer new releases. If you're prepared to wait, you never have to pay full price. Many different sites, Google being the main one, offer the option of setting a price alert. Basically, you input the exact item you want, and the lowest price (within reason, of course) that you want to pay. When it drops to that price or lower, you get alerted to buy it. 22. Practice the "Pantry Principle"
Blogger Amanda Brackney coined the term "pantry principle," and it's an excellent way to save. The basic premise is to stock up on items you use regularly whenever they go on sale. We all need toilet paper and soap, so when they drop to their lowest price, buy in bulk and save. 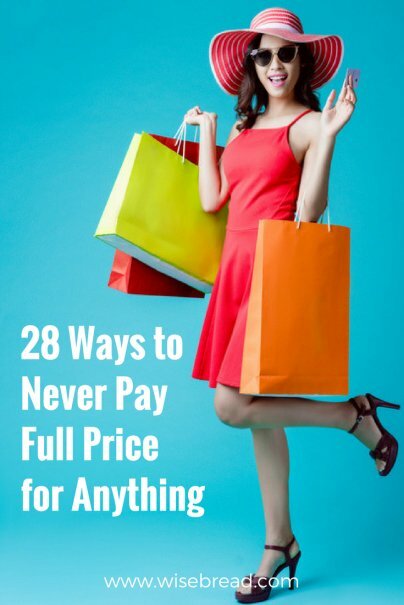 This way, you'll never pay full price on items you'll always need. One of the biggest examples of getting discounts for a group is health insurance. However, that idea spreads way beyond health care. Groupon was founded on this very idea, and you can find multiple sites out there offering discounts when multiple people buy the same item. Almost every online retailer will lure you in with a first-time customer offer. These savings can range from as little as free shipping, to a whopping 50 percent off. Just register your email, wait for the offer code, and then shop with your discount. You can purchase discount gift cards for almost any store. Before you shop, drop by a site like CardPool or GiftCardGranny, and search for the store you want. Discounts range anywhere from 2 percent to 30 percent off. Just remember to check the terms and conditions on each card first for expiration dates and purchase restrictions. 26. When shopping online, sort prices "low to high"
The easiest way to check for deals is to switch from the default sorting (which is usually relevance) to the "low to high" price option when you're shopping online. You will have to dig through the selection to find what you're looking for, but apply filters, including four-star reviews on Amazon, and you'll find some killer discounts. Hey, getting one year older doesn't have to be all bad. A lot of places, including restaurants, salons, and retailers, will give you a discount or freebie on your birthday. Just be ready for a really annoying song in a restaurant.